So wrote the thirteenth century Thamizh poetess, Auvaiyar. And Chitra’s narrative too runs its course around the analogy of a coconut tree. Leading an eventful life, evolving from one triumph to another, she is thwarted by the most daunting challenge of her life. Will she face up or call it quits? Will she surf over adversity to achieve true success and lasting happiness? Like coconut water? 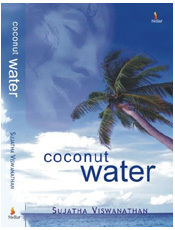 The coconut tree draws the saline waters of the oceans from the coastal regions, gets nurtured, and filters this aqua into the sweetest coconut water. Will Chitra rise above her circumstances? Through the sojourn of Chitra, this novel takes you on a voyage of diverse life situations thus inducing introspection. A compelling story wherein the reader could step in and out of conditions that are commonplace, the conditions that could be faced by any and every one, and activate a thought process to emerge stronger and more contented.